Ragley Hall is the family home of the 9th Marquess and Marchioness of Hertford and the seat of the Conway-Seymour family. The hall was designed in 1680 by Robert Hooke, friend of Sir Christopher Wren. It was completed in the 18th Century by James Gibbs who designed the Great Hall, the exceptional plasterwork in the main reception rooms and the impressive stable block in the 1750's and James Wyatt who added the central portico in 1780. The hall stands in four hundred acres of picturesque parkland landscaped by Lancelot 'Capability' Brown in the 18th Century, and twenty seven acres of formal gardens laid out by Robert Marnock in 1873. 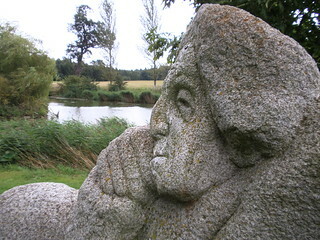 The park and gardens provide a spectacular and unique setting for the Jerwood Sculpture collection.